For those of us who got the "Indian Lore" bug as kids, the first project we usually did was a piece of loom beadwork. And of course, our first loom was the simple metal wire loom with the "springs" at the end. Well, that loom is still being made and here it is. It is not the best loom on the market, but works as well today as it did long ago. It's great for beginners and kids because you don't need to spend a lot of money to get started. This little kit has all you need to sample the craft. Included is a metal bead loom, a small packet of seed beads, thread, needles, and simple instructions. Because it has sharp needles and small beads, it's recommended for children 9 and older along with adult supervision (but so are most of the products we sell!). If you like the craft, you will certainly want a better loom later, but this is good place to start. This is a great loom if you need to make wide belts for straight dance, fancy dance, or any other project. It is an extra wide 5 ¾ inches and can accommodate patterns up to 85 beads wide. It is 7 ½ inches long and has heavy duty spools at the end for winding your completed work. Made of high quality wood and very sturdy. An excellent bead loom. This is currently our best-selling loom. Possibly the widest bead loom on the market with a working width of 10 inches, it can accommodate projects of approximately 160 beads in width. Excellent for very wide projects. Made of handsome dark wood, the overall size is 13 x 11½ inches. Includes basic assembly and use instructions. 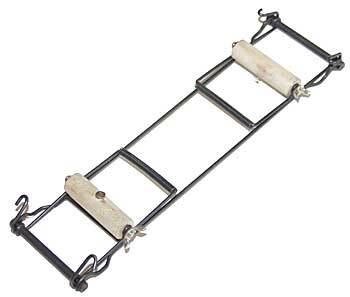 Please be aware that this loom has a shipping weight of 3 LBS and may result in higher shipping costs than our web site estimates if it is the only item you purchase. This is a very nice variation of the basic wire bead loom. This one folds flat for easy storage and transportation. It is also a little sturdier than our Basic Bead Loom Kit. Includes five packets of seed beads, needles, thread, and needle threader to get you started. There are not enough beads to make much, but there are enough to play with it and sample loom beadwork. The most popular, rugged loom on the market. 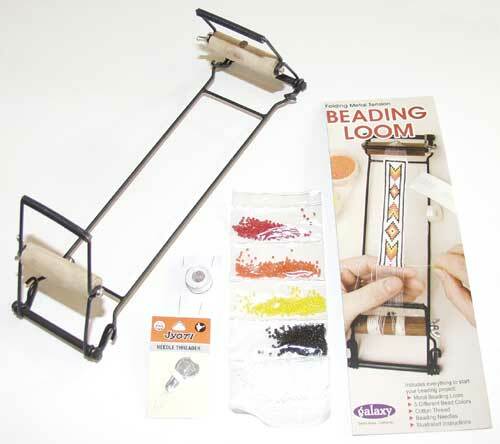 This loom accommodates beadwork up to 5" wide. Add longer dowels for even longer projects. Includes directions on loom beadwork, many pattern suggestions and graph paper too!